LT8511A is a low cost high performance single port HDMI receiver which is compliant with HDMI 1.3. The RX can receive 1080p (8/10/12bit deep color, up to 2.25GHz data ratio) input. Besides it supports Analogue Video-output up to UXGA and 1080p with three high resolution DACs. The chip integrates Equalizer, HDMI core and HDCP engine in a single chip. • On-chip HDMI receiver with Equalizer, supports 8/10/12bit deep color, up to 2.25GHz data ratio. • On chip receiver core which is compliant with HDMI1.3 specification. 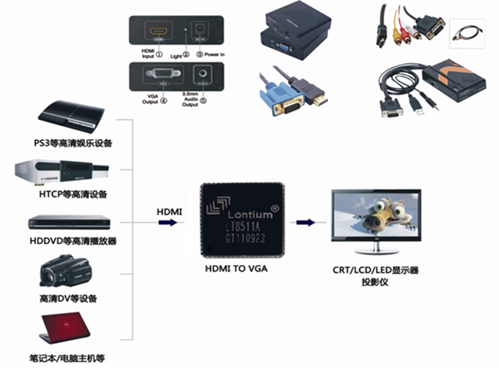 • On chip HDCP engine which supports repeater and is compliant with HDCP1.3 spec. • Supports pixel clock rate up to 165MHz. • Supports analogue video output up to UXGA and 1080p with three on chip DAC. • On-chip audio decoder which support 2-channel IIS and SPDIF audio outputs. • Support audio soft mute. • On chip YCC422 to YCC444 conversion. • On chip YCC to RGB and RGB to YCC conversion in ITU-R BT.601 and 709 color space. • Support separate sync output and SOG/SOY. • Flexible interrupt registers with interrupt pin. • Link on and Valid DE detection.